Like some 1,000 cities around the world large and small, Ann Arbor jumped into the bike sharing fray back in 2014 with the aptly named ArborBike program. Now entering its fourth year in operation the initial funding is starting to wind down and the future of the service is uncertain. Three years in now, most have probably seen the bikes in motion but a quick refresh for the uninitiated: There are 13 stations around town housing 125 bikes, available for rent with a credit card to the general public by the day, the month or the year. The system is owned and operated by the Clean Energy Coalition in partnership with the Ann Arbor Area Transportation Authority (“AAATA”), University of Michigan and City of Ann Arbor. They have a website, pretty straightforward really. The funding and future of the system however, is less straightforward. The University provided the bulk of the funding for the first three years, committing $200K annually. For 2017, they have reduced their commitment to $80K, dropping to $40K in 2018. Other sources, primarily the Downtown Development Authority, City of Ann Arbor and the AAATA, have stepped up their support to fill in the gaps and ArborBike is operationally funded through the 2017 biking season. Financing for 2018 and beyond is a big question mark but there are some (relatively) simple solutions in sight. First, it’s important to understand that bike sharing is a form of transit. Even in places like Chicago or London, most trips are not tourists poking around the sights, they’re residents getting from A to B (or maybe poking around the sites a bit themselves). As a percentage, fare collection at ArborBike is already on par with other forms of mass transit and can improve with increased ridership. Second, the system grew organically by 24.57% to 17,675 trips in 2016 according to Sean Reed, Executive Director of the Clean Energy Coalition and head of the service. That’s with no change in service, bikes or stations. It’s starting to take hold. ArborBike needs the proper investment, marketing and partners to not only secure funding but absolutely thrive. Here are three ways to get the system to take off in 2018. The fastest way to boost membership and revenue would be to include the service with the UM student MCard. There are 44,718 students at the Ann Arbor campus, each is assessed a couple of small semester fees on top of tuition including $4.25 for Student Legal Services, $4.60 for Central Student Government and $32.50 for University Unions & Recreational Sports Improvements. Adding a few dollars to that last fee and updating the technology so that the MCard could provide immediate access in an integrated system would result in explosive ridership growth and significant operational funding. The same integration should be established with the AAATA, specifically with GoPass. GoPass is the DDA sponsored program that offers heavily discounted unlimited use bus passes for employees working downtown, there were 611,353 rides in 2016. That pass should include ArborBike, again with a unified card system if possible. The system is growing but is limited with the current number and locations of stations. I’ve covered this previously on the blog, the present stations are virtually all at final destinations. They’re downtown, dotted around campus and at the hospital. The problem is that many, I would argue most, people are traveling to those destinations from an area that does not have an ArborBike station. Namely neighborhoods around town, heavily student areas to the south of campus but all over the core of our city. Reed believes there is funding for additional infrastructure from the Congestion Mitigation and Air Quality Improvement Program (“CMAQ”) and other sources if operational financing can be secured. There are also some new examples of stationless bike share that might be an option. The bikes are equipped with locks and GPS technology that would allow them to be dropped off and picked up anywhere within a certain boundary. While the bikes themselves are more expensive, it saves money on kiosks and provides for greater flexibility. The final piece of the puzzle is identifying a potential corporate sponsor. Most of the larger systems are underwritten by an enormous company, think Citi Bike in NYC, Santander Cycles in London (formerly Barclays Cycle) or Biketown in Portland (Nike). It’s possible that someone local could step in (Bank of Ann ArborBike anyone? they do love to help), the branding and advertising would be excellent but it’s a probably a pretty big check to write. I think the obvious choice here is the closest Fortune 100 company to Ann Arbor, Ford Motor Company. If that sounds crazy, you might be surprised to know that Ford is looking far beyond automobiles, embracing new technologies and all forms of mobility in a changing world. They’re already sponsoring San Francisco’s program, bought crowd-sourced shuttle service Chariot and are opening an office in downtown Ann Arbor. Seems like a perfect fit. 2017 will be a pivotal year for ArborBike, will the growth continue, will funding be secured, will it survive? The suggestions above are easily attainable but it will take a number of organizations working together to achieve them. Sean Reed says the five year goal is 100,000 bike trips and I believe that is absolutely within reach with the right expansion and partnerships. Back in November the proposed funding for the Regional Transit Authority Master plan failed at the ballot box dashing the hopes of transit proponents and supporters of regionalism across Southeast Michigan. While certainly a setback, it provides an opportunity for the RTA to step back, reassess and tweak the plan and marketing for another vote in 2018. Below are a few suggestions and considerations for the next go round. First of all, planning an entire mass transit system essentially from scratch for a region containing some 5 million people across 4 counties is a massive undertaking. The RTA staff and their consultants did an admirable job but there’s always room for improvement. The current plan relies on Bus Rapid Transit (“BRT”) in the primary corridors, namely Woodward, Gratiot and Michigan Avenue. At first glance it makes a lot of sense. BRT is cheaper and more flexible and those roads are massive, 100-120 feet wide through much of the city, up to 200 feet of ROW further from the city center and in the suburbs. However, these are long corridors, Pontiac to Detroit is some 30 miles making this one of the longest BRT lines in the US. There’s over 25 intermediate station stops. Projected travel time is 70 to 80 minutes. That’s an untenable commute for your average suburbanite with a choice. BRT is primarily a substitute for light, city rail, think the Chicago L or the New York City Subway. Those systems work mainly within the city itself, extending out to a few inner ring, city-adjacent suburbs. To go further out you need to take a regional train, something faster with fewer stops. There’s a lot of rail infrastructure in place already with clear rights of way in and out of downtown Detroit from a time when the area actually had a commuter rail network. 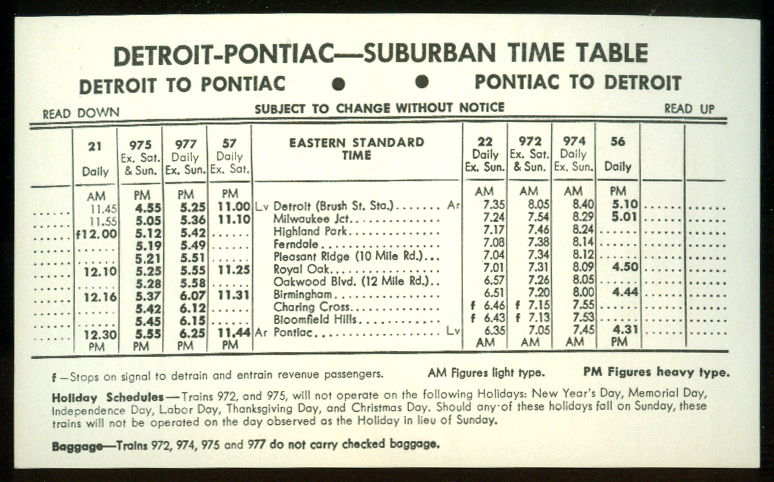 The trip from Pontiac took 60 minutes on the train (or 41 minutes express) over 50 years ago. There’s rail going north to Pontiac, east to Mt Clemens and Port Huron, west to Ann Arbor and Plymouth and south to Toledo. The RTA is only planning on the Ann Arbor service and I think that’s very disappointing. A relatively high speed train from Troy to downtown Detroit in say 30 minutes or so (essentially possible in the 1940’s so hopefully manageable now) is a truly compelling commute option for your average worker or Tigers game attendee. Twenty stops on the bus? Not so much. I would want to see the other radial routes as well but the Woodward main line makes all kind of sense to start with. Lastly, and I’ve discussed this previously on this blog, the lines need to go into downtown. A train to New Center is all but worthless and you’re not going to get travelers that have a choice. I would love to take the train from Ann Arbor but I’m not going to drive, bus or Uber to the station here, hop the train for an hour and then take a 20 minute Qline ride on the back end to work or play. That’s just not realistic. I hear from transit detractors all the time that autonomous cars and other emerging technologies are going to eliminate the need for public transit. That’s not true at all but it’s an objection that needs to be met head on and there are potentially some ways to utilize more tech going forward in the plan. This is a plan where much of the infrastructure is 10 or more years away yet the tech isn’t all that strong by today’s standards. Essentially buses with drivers, GPS tracking and signage and shared ticketing with a smartphone app, etc. Basic things that most major cities have had for years. This is the home of the auto industry and hopefully home to the future of autonomous vehicles. Think to the future, think bigger. Work with Ford’s Chariot service, plan for autonomous vehicles, cars, buses, trains. Partner with the GM-backed Lyft service for first and last mile connections. You want votes, aspire and inspire. Not everyone is going to use public transit especially in the cradle of the automobile. If you want to get voters on board in places like Macomb County you’re going to have to convince them there’s something in it for them. With two years to educate folks, focus on what’s important to them. It’s been well documented that proximity to transit boosts property values and while that was certainly a bullet point in the plan, perhaps it needs to be more of a focus. Use studies, show heat maps to give people actual potential numbers to consider. This goes back to my previous point about rail though, the impact of fixed rail transit on property values is much clearer than that of BRT. This idea is a little more out there and I don’t even know if it’s legal. The RTA was asking for 1.2 mills from every property owner in the four county region. I get the argument for regionalism and a working public transit system is good for everyone but it’s still really hard to convince someone living in rural Washtenaw County of the benefits of this system to them. They’ll see little to none of the property value increases I mentioned above and they’re very unlikely users. How about a millage that’s tiered based on proximity to service? A little complicated to be sure and I have no idea if the math works, but something like 0.5 mills withing a mile of a regular bus route. 1.0 mills within a mile of a rapid bus or train line. 2.0 mills within a half mile of a rapid bus or train line. If you’re more than a mile from any service you pay nothing. The backbone of the RTA’s plan is solid and I think fundamentally a BRT-based system is a good place to start. High speed rail in and out of DOWNTOWN I think is an absolutely necessary part of the service as is increased technology and autonomous vehicle elements. The rest is just marketing. The RTA has two years to make changes and improve their outreach and education, this blogger wishes them the best of luck. The Regional Transit Authority (“RTA”) has been in the news for all the wrong reasons recently with politics as usual getting in the way of regional cooperation. Essentially the counties of Oakland and Macomb are arguing they’re not getting enough service for their tax dollars and it feels like the old city versus the suburbs battle that has held back the Metro area for a generation at least. Washtenaw County actually sees the least in terms of new service as Ann Arbor is somewhat removed from Metro Detroit and already has a robust transit system (in fairness, it will also be paying the least) . That said, I support the RTA’s plan, it’s important for the region and connectivity to our major city is fundamentally crucial. However, the planned connection via commuter rail has one critical flaw: the final destination is in New Center, some 3 miles north of where it should be in downtown Detroit. Although Ann Arbor exists in its own little ecosystem, it actually benefits significantly from proximity to Detroit and the amenities and infrastructure that comes along with a major market. A generation of Southeast Michigan residents, including many Ann Arborites, turned their back on Detroit seeing the relationship as a detriment as the city declined. The winds of fate have changed and national movement back to urban areas is not lost on Metro Detroit as a whole swath of young suburbanites are discovering the city for the first time and apartments and offices cannot seemingly be built or renovated fast enough to fill the demand as people gravitate towards downtown. In turn, many people are starting to see that what’s good for Detroit is good for the region and the state as a whole, and regional cooperation is finally taking hold. One big step in that direction is the creation of the Regional Transit Authority of Southeast Michigan which began operation in 2013 as a joint effort between the counties of Wayne, Oakland, Macomb and Washtenaw to coordinate regional public transit. The RTA released its $4.6 billion master plan in May of 2016 with plans to put the measure on the November ballot for voters to approve a funding millage (although that timeline is now in serious jeopardy). Because the area is so far behind in terms of transit and regional cooperation in general, the plan is vast, spanning 20 years and hundreds of miles of new or improved service. Requiring support from a wide range of people and geographies means it includes something for almost everyone; rapid transit bus, commuter rail, street car, local bus service, etc. Ann Arbor is already blessed with a strong public transit system, the AAATA, so it will see some improvements but less of a complete transformation than some communities. The main components include express bus service to Plymouth and the airport, a bus rapid transit line down Washtenaw between downtown Ann Arbor and Ypsilanti, and commuter rail service to Detroit. Ann Arbor has always been intrinsically linked to Detroit, the university was first founded there in 1817 before moving out to the country in 1837. The Michigan Central Railroad opened the first rail line connecting the two cities just a couple years later in 1839. For 145 years trains regularly ferried passengers between the two cities, primarily operated by Penn Central and later by Amtrak on the Michigan Executive line. The service was terminated in 1984 due to declining ridership, aging rolling stock and the State of Michigan’s decision to withdraw its support. The prospect of resuming this vital link is exciting but the RTA’s routing plan may prevent the service from being successful. The current RTA plan for commuter rail service relies on the existing rail line currently used by Amtrak running from the Depot Street station just north of downtown Ann Arbor to the New Center station at Woodward and Baltimore in Detroit. The biggest issue arises right off the bat, the line carries passengers to New Center, a neighborhood some 3 miles north of downtown Detroit. While the station will be linked to the CBD by the soon to be opened QLine streetcar on Woodward, that adds a connection and a 15+ minute commute to most jobs and points of interest. New Center is a relatively strong neighborhood (and improving) with immediate access to Wayne State University and the Henry Ford Hospital. The iconic Fisher Building is there as well as Cadillac Place, a massive landmark office building home to the State of Michigan offices. There are certainly some jobs and noteworthy cultural icons in walking distance but they pale in comparison to the downtown area. As the service is primarily targeted at people heading into the city for work, I tried to take a quick look at commuter data from Washtenaw County to Detroit using the U.S. Census data from their 2006-2010 CTPP package but the numbers weren’t great. The data is old, really before the development of downtown Detroit took off, and the margin of error is high. For example, there have been over 16,000 jobs added to greater downtown area since 2011, most of them in the CBD. For what it’s worth, 5-10 years ago over twice as many commuters from the Ann Arbor area reported working in census tracts in the downtown area versus the New Center area. For a more current but less scientific approach I also looked at local commuter van pooling services and their destinations. Using vRide to find available routes I noted 2 potential routes to New Center and 26 to Downtown. The work-related commuter data is compelling and that’s to say nothing of the cultural points of interest. While there are many institutions in Midtown as well, the CBD is home to three major sports teams, several world class theaters and countless restaurants and bars. Suffice to say, more people are visiting downtown Detroit than any other neighborhood and it’s not close. And while the connection to the Qline is a positive, asking riders to complete another transfer while also making the travel time less competitive with driving is a serious detriment. It’s clear to me that the rail line needs to eventually run downtown. It also needs to run frequently and continue into the evening and on weekends to service pleasure seekers as well as worker bees. For the first phase, the current routing makes sense. Most of the infrastructure is in place and commuter service could be up and running in a shorter period of time with less cost to the taxpayers. Long term, routing to downtown needs to be explored and I’ll throw out one suggestion. The easiest right-of-way from the west into downtown is probably Michigan Avenue. Seven lanes across at some points, there is excess capacity for vehicle traffic that could be taken up by railroad tracks. I’m suggesting the trains take the established Amtrak route, hopping down onto Michigan Avenue where the two meet between Scotten and Hubbard and then continuing in dedicated lanes to downtown. This potentially gets in the way of the RTA’s plan for Bus Rapid Transit (“BRT”) in this corridor but I believe the two could work in tandem. Additionally, the tracks could be used for an extension of the QLine down Michigan, it’s 2.7 miles to Campus Martius Park where it could meet that line, very similar to the 3.1 mile Woodward stretch. In the short term the commuter line could end with a basic station on Michigan in between the Rosa Parks Transist Center and Campus Martius, perfect for making bus connections, hopping on the People Mover or picking up the QLine to go to Midtown or New Center. I’m picturing something like Austin’s MetroRail which enters downtown at grade in the street and terminates in a very basic platform station. It’s not ideal but the location is more important. Obviously this is a very rough plan but a significant improvement over the planned service. Although it’s a mundane, fact-of-life type of service in many metro areas, the prospect of being able to take a low stress and efficient train ride into downtown for work or for play is pretty exciting here in Southeast Michigan. Let’s hope the RTA Master Plan continues to evolve and that the powers that be see the light in working on a route to downtown Detroit from Ann Arbor. Way back in March, 2015 it was announced that Tom Brady (not that Tom Brady) of Diamond Jim Brady’s in Novi had purchased the former Vellum building on Main Street with the intent to create a new outpost of his Jim Brady’s Detroit restaurant concept. I expressed some reservations about the 1950’s lux throwback theme in my Spring Restaurant Roundup a couple months back but I’ve never been to the Royal Oak location (a third spot in downtown Detroit is targeted for 2017) and will give the benefit of the doubt to anyone that would like to invest in our fair city. The Royal Oak restaurant features modern takes on American classics and it appears the Ann Arbor spot will be more nightlife oriented than Vellum with three levels of space and two large bar areas. Brady filed plans with the Historic District Commission on June 24th to make renovations to the building including a new storefront, mechanical and facade improvements and all new dining spaces. I’m excited about this because the building at 209 South Main was built way back in 1868 and is in need of some restoration. Plans include rehab of the 3rd floor windows and the installation of a decorative cornice that at least imitates the way the building looked in the 19th century. Image from HDC plan submission by Rossetti Architects. The cornice isn’t nearly as elaborate as the original but they are difficult elements to re-create. For the dreamers, what if Brady gets with Governor Synder (who lives in the condo on the top floors of the Four Directions building next door) to replace the whole cornice to the way it looked originally? Jim Brady’s will occupy the north half of the 4th building down as seen in this view looking south down Main Street from Washington in the early 1900’s. Probably pie in the sky but a blogger can dream. Regardless, I’m glad to see the investment in the building and I wish the restaurant the best of luck, I’ll be sure to check it out. There has been a lot of new development in downtown Ann Arbor in recent years and the vast majority of that has been apartments, much of it catering to students. I thought I would assemble a summary of what’s been completed and what’s on the table. This is only formally announced rental developments and thus does not include condominium projects. There are a couple of other things in the works on both the student and market rate apartment side that could be added to the list in the near future. So 2,097 total units encompassing 4,762 beds could conceivably be added to the market in a roughly 10 year time frame. Is this a lot? Considering there was essentially no units added in the downtown area in the preceding 30+ years, I don’t think so but let’s take a look at a couple numbers. Everyone asks me about student housing and for good reason, student high rises are the biggest thing changing the skyline of Ann Arbor right now. Including The Foundry which just opened last month there have been 2,557 beds of private student housing built in the greater downtown area since 2008. If you add in the Munger Graduate Residences built by the university and The Courtyards (a private student development on north campus) you come up with a total of 4,085 beds. In that time the University of Michigan has added 4,117 students. Actually seems just about right. There’s another 1,241 beds proposed by 2019 while enrollment is expected to grow anywhere from 749 to 2,352 students depending on which trend analysis you use. Based on the rhetoric from the administration, I would assume the lower end of that spectrum, perhaps 1,000 or so, many of them graduate students. Still, this seems to buck the thinking that new housing is pulling many kids out of neighborhood homes. Long term I think that is a theme but it seems that to date and in the short term future, housing supply is meeting growth. Additionally, our own research at my day job shows that occupancy in off campus housing at U of M was 98.6% for the 2015-16 school year (national average is 95.3%) with rent increases averaging 7.8% over 2014-15. Pretty strong market. The market rate apartment side is harder to gauge compared to say, population growth, but the numbers are modest anyway. There have been just two developments with 311 units and 391 total bedrooms between them, Ann Arbor City Apartments and 618 South Main. Both are 100% occupied with rising rents. I was told by management at 618 that the lease up was the fastest for a new development project they’ve ever been involved in. Given the macro demand for urban living and relative lack of supply, it’s pretty easy to surmise there is still a substantially untapped market for market rate apartments catering to young professionals, empty nesters and essentially anyone else looking to rent an apartment. Granted the rents are out of reach for many but that tends to be the case with new construction (and that’s a whole other blog anyway). Against my better judgement (I’m guilty of reading too many MLive comments) I included parking numbers in the table as well. I actually think the ratios of parking spaces to units/beds is not out of line but I realize many people disagree (that’s perhaps another blog as well). It’s important to remember we don’t want to really encourage driving downtown but rather the use of more efficient, sustainable transit. Also, the hope is these buildings will still be here many years from now and research shows the use of private automobiles decreasing substantially in the future. It’s all about smart growth folks. In summary, it really doesn’t seem that student housing is overbuilt, at least not yet, but new buildings will have to start attracting tenants from older properties rather than relying on natural enrollment growth. Downtown apartments, however, seem to have plenty of runway with demand almost certainly far outstripping supply. * Ann Arbor City Apartments is built on top of a public parking garage in partnership with the city. There are 251 total spaces. 73 available for full access, 73 available for nightly access and 105 public spaces. ** Total number of bedrooms have not been established for The Collective on 5th, the proposed development on the Library Lot. This number assumes 50% of the units to be one bedroom or studio units, 50% to be two bedroom units based on the number of units projected and target demographic. This blog is ostensibly about downtown Ann Arbor but I live in Burns Park and walk through the park itself every day. Basically I couldn’t help sharing a few thoughts on some ways to improve it. Let’s get this out of the way, Burns Park is fantastic. It is the quintessential neighborhood park. The gorgeous Burns Park Elementary School forms its western flank and the park itself contains almost everything one could ask for: ball fields, tennis courts, play equipment, a senior center and a shelter building. It’s one of the biggest reasons we bought a home in the neighborhood. People may literally yell at me for suggesting we change a thing. That said, like so much of our infrastructure, some facilities are showing signs of age and part of the point of this blog is to look around and say, “This is great but how could it be even better and how do we position it for the next generation?” First, of course, a little history. The land where Burns Park currently sits is the former home of the Washtenaw County Fair Association, established in 1890 but used for various fair and equestrian activities long before that. The land was purchased by the city for a public park in 1910, naming it Burns Park in honor of George P. Burns, a University of Michigan botany professor and inaugural member of the Park Board. The city continued to lease a portion of the land to the Ann Arbor Driving Club for a horse track until 1921. The double row of linden trees there now roughly duplicates the original path of the track, seen clearly below (don’t worry there are a couple little saplings doing their best to fill that gap in the southwest corner). The mound of dirt that had been at the center of the track was moved to the southern edge of the park and is now colloquially known as “Magic Mountain”, a popular mini sledding hill for generations of Burns Park children. The current shelter, built in 1957, replaced an 1898 log cabin and the Senior Center is an expansion and renovation of the old horse barn originally built in 1912. In 1925 the city sold the western portion of the park to the school board for the site of the Tappan School. When Tappan moved to its current location on Stadium Boulevard in 1951, the building was renamed Burns Park Elementary School and has housed grades K-5 ever since. There have certainly been minor improvements and changes but the 15-acre park has remained essentially unchanged since the 1950’s. Okay, background history established. On to the future. Below are a few ideas for Burns Park, loosely in order of priority and/or awesomeness. The Burns Park Shelter, used as a warming hut in the winter, was built in 1957 in the northeast corner of the park. It’s a pretty basic, low slung brick building with restrooms, a garage area and a community room with a kitchenette. There’s a little outdoor area with some barbecue grills, the building is available for rent for $137 per day for a summer weekend. I don’t personally know Bill and Kathy at Argus or Janice at Blank Slate but perhaps one of the 11 readers of this blog do. Any plan would obviously take cooperation from the city and Parks and Recreation as well. I’m excited about this idea in particular so perhaps we can get some traction. This one is a no brainer. The majority of the lots in Burns Park are relatively small and old growth trees, while lovely, make gardening at home a near impossibility for many people. Project Grow has been facilitating community garden plots in Ann Arbor since 1972 and now boasts 15 sites around the city providing over 350 individual plots. Some locations have as few as 5 plots. There are a number of out of the way areas within the park that could support 5-10 plots depending on the amount of sunlight required. There are some fairly wild areas behind and adjacent to the tennis courts that could be a fit or perhaps the northeast corner of the park that is actually across Baldwin Ave? That site is usually home to one lonely picnic table and is rarely used. I would be shocked if a small community garden site in Burns Park didn’t have a waiting list a mile long if implemented. I’ll be the first to admit that I’m a little out of my depth when it comes to the Senior Center. I don’t fit the target demographic and as such I’ve never set foot in the building. That said, it seems to fill a need and from what I can tell keeps fairly busy most days. It requires a membership, is open most weekdays from 9-4 and can be rented after hours for various events. The Senior Center is a nice amenity to the park and the neighborhood but I think there’s untapped potential there. I would propose a new, larger building that would be open to people of all ages. Something with open space and community rooms on the ground floor that could keep up with programming catering to seniors and perhaps a second floor with a fitness center and more space that could serve families and people of all ages. The Burns Park Social Club has a nice ring to it. Parking could be an issue but hopefully you could control that through parking passes and/or membership priority for neighborhood residents. This looks like a mini YMCA in my minds eye and a really strong neighborhood amenity, a town hall of sorts for Burns Park. As a huge baseball fan this pains me a bit but the American youth sports landscape has changed. The interior of the tree ring (I call this the Great Lawn in my head) contains two baseball diamonds which take up the majority of the space. Fields for soccer, ultimate frisbee and football are sort of jury-rigged around the infields. Again, it pains me as a baseball fan but we could probably stand to eliminate one diamond and put up some permanent soccer goals there. Both diamonds are in mediocre shape at best and are rarely in use at the same time but there are often 3-5 soccer games or practices going on at once. Most of the space should probably remain flexible but one legitimate soccer field would likely find good use. Side note: Please no field turf. I get the advantages but let’s just leave Burns Park regular old grass, dandelions and all. Like virtually all parks in the city, most of the infrastructure could use a face lift. I mentioned the ball diamonds above, the basketball court is also in need of a resurface. The play equipment is a mixed bag but my favorite is the old wading pool that now sports the super popular funnel ball pole (when was this ever a thing? I remember a brand new one at our elementary school in the early 80’s that wasn’t cool then). There’s also a couple Pétanque courts that were built with the best intentions back in 2009 but I’ve walked by probably 100 times in the last year and have yet to see them in use. The entrance signage is faded and the whole park could probably use a bit of color, flowers, etc. Not too much, Burns Park is and should always be more about function than beauty. That’s what I’ve got for now. Just a few ideas that have bounced around the ol’ noggin as I’ve walked through the park with the dog, annoying my lovely wife with half baked schemes. Please feel free to share any more in the comments or via your social media of choice. You can find TreeDownTown on Twitter or Instagram.